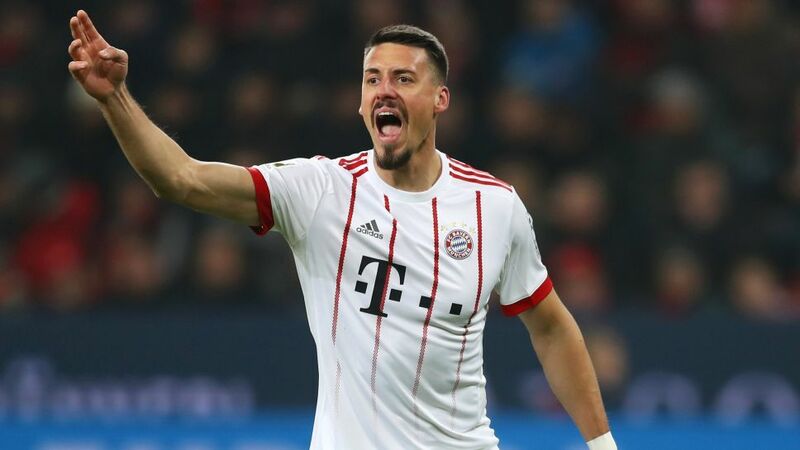 Sandro Wagner swapped Hoffenheim for former flame Bayern Munich during the winter transfer window. Sandro Wagner does not think that playing second fiddle to Robert Lewandowski at Bayern Munich will adversely affect his chances of going to the FIFA 2018 World Cup with Germany. The 30-year-old only played 12 minutes of Bayern's 3-1 victory at Bayer Leverkusen on Friday, but has no regrets whatsoever about his decision to forgo regular first-team football with former employers Hoffenheim in favour of a return to his boyhood club. "I'm at the best club in Germany now - one of the best clubs in the world, in fact," Wagner said, fresh from making his first appearance for Bayern in over a decade. "I don't feel that's a bad thing as far as the national team is concerned. I'm not too worried." Wagner's recent record for club and country gives him ample cause for optimism. The former Werder Bremen, Kaiserslautern and Hertha Berlin target man scored 14 goals for promoted Darmstadt in 2015/16, 11 for Hoffenheim last term and has struck four times in 12 top-flight outings so far this season. He also netted five goals in seven senior internationals in 2017. "They've known about me for a long time now, thankfully, and there's also plenty of video footage of me! There’s also a while to go [until the World Cup] and a lot can happen in that time. I've managed to impress them in recent years and I've always given a good account of myself for the national team." A rough-and-ready type from a bygone era of centre-forwards, there is simply no player quite like Wagner at Bayern or in the current Germany set-up. He's physical, robust and a natural target man - and was almost certainly on the mind of national team head coach Joachim Löw when he decided to send some of his backroom staff to Leverkusen's BayArena on Matchday 18. The only disappointment from their perspective is that they didn't get to see more of the iron-clad striker on his second Bayern debut - not least given the pre-match projection that he would start in the absence of the injured Lewandowski. "I don't mind," Wagner said of his bit-part role. "I tried to help the team after being brought on, putting myself about, holding the ball up and tracking back. I managed to do just that. I would've loved a goal, but didn't really have an opportunity to score. I did everything that could be expected of me. "When I play I always want to give my all and earn my place in the team. I want to go to the World Cup in Russia this summer, so it's very important that I perform for Bayern. I just want to have a good second half of the season, just like anybody else."